We not only review the competitiveness of your menu and tell you where your opportunities lie; we’ll formulate a food and/or bar development strategy to steer you toward more profit. 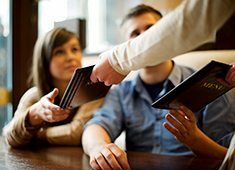 Retailers call it “assortment rationalization” and the process is similar (but more detailed) for restaurants. We look at cost of goods, product mix, “dogs-stars-workhorses-challenges”, your brand filter, food safety, preparation methods, vendor pricing, holding methods, china and glassware, portion control, food handling, and much more – all to find the weak spots in your menu. Sometimes your menu is too big so we can help you streamline it. Other times you’re not moving your inventory fast enough because you don’t offer enough ways to consume a product. Regardless we can shine a bright light on what’s happening while giving you a plan to fix it. 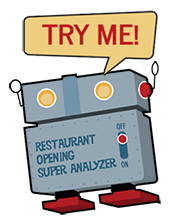 From there we can also teach you how to analyze your menu going forward and what to do about the things you find.